Browse All Colored Diamond Pendants. Browse All Colored Diamond Earrings. Men's Bracelets (For Him). Browse All Mens Colored Diamond Rings. Wedding Rings & Engagement Sets. Browse All Wedding Rings & Engagement Sets. 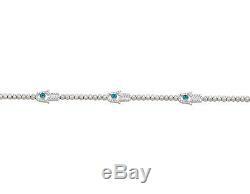 14k White Gold Hamsa or Hand of Fatima Evil Eye 7 inch Diamond Bracelet 2.25ct. The hamsa or Hand of Fatima, is used as an amulet against the evil eye. This 8MM X 13MM hand-shaped pendant with an eye at its center is fashioned in 10k white gold (9.4 grams) and decorated with dazzling diamonds. The five hand pieces are connected with a 2MM wide row of bezel-set diamonds that totals to 2.25ct and color ranking G-H, VS2-Si1 clarity. The hand represents blessings, power and strength, deflecting the evil eye. 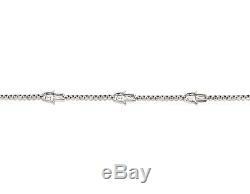 This 7 inch bracelet secures with a open clasp and side clips. 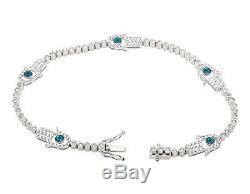 Buffed to a brilliant shine, unique and eye-catching bracelet is a great way to let her how much you care about her. All diamonds are 100% natural. If you were to please provide us with the reason the item does not meet your criteria, we would be happy to recommend something that does. The item must meet the following criteria to be eligible for a return: 1 Item must be in its original unworn condition 2 Item must not have been sized or customized in any way. DIMENSIONS: 8MM X 13MM hands, 2MM wide. BRACELET WEIGHT: 9.4 grams. CARAT WEIGHT: 2.25 CT.
OTHER DETAILS: This bracelet comes in a beautiful presentation box and in-house appraisal. 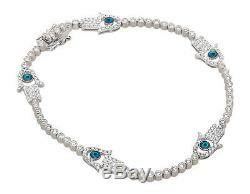 The item "14k White Gold Hamsa or Hand of Fatima Evil Eye 7 inch Diamond Bracelet 2.25ct" is in sale since Monday, October 19, 2015.